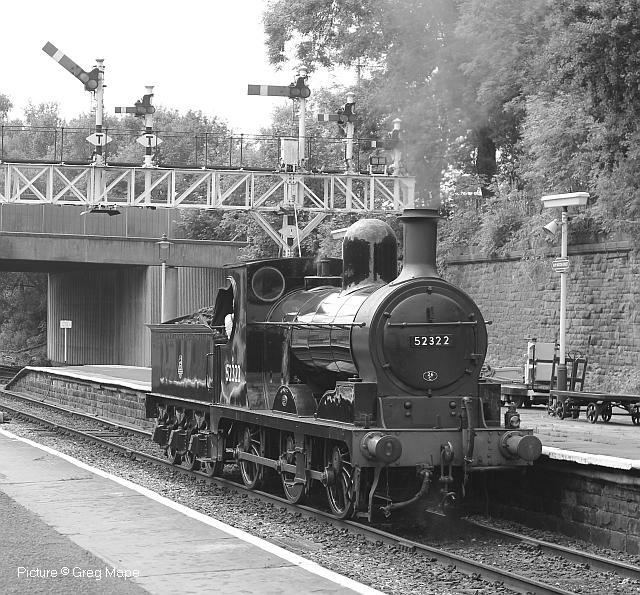 Friday 1 September Clwyd Railway Circle Dave Walters 'Railway Memories' The first half of the programme will feature images from John Dickinson, sadly no longer with us taken from 1970’s to 1989 in North Wales and other areas. The second half features images from Pat Webb taken from 1949/50 to the 80’s and 90’s mostly in black and white. Friday 6 October Clwyd Railway Circle Les Nixon '55 Years of Railway Photography - Part 3' A selection of railway pictures which include genuine BR steam, a wide variety of mainly older modern traction along with industrials, some preservation and brief visits, worldwide, to nearly 20 countries. Friday 3 November Clwyd Railway Circle 'Snowdon Mountain Railway' A presentation given by Mike Robertshaw Msc IEng MIED, Senior Engineering Manager of the railway. Friday 1 December Clwyd Railway Circle 'Members Night & Christmas Celebrations' Members are invited to give a 15 minute presentation of their choice (any format). FREE tea/coffee & festive treats during the interval. Contact David Jones 01244 537440 to book a slot. Friday 5 January Clwyd Railway Circle Mike Blackburn 'The Welsh Highland Railway (NWNGR)' A history of the North Wales narrow gauge and Croesor Tramway and the linking to form the Welsh Highland Railway, restoration and building of the new. Friday 2 February Clwyd Railway Circle John Sloane 'From Vulcan Foundry to the Khyber' British built steam at work in Pakistan, It includes pictures taken on the spectacular line up the Khyber Pass to the Afghan border. Friday 2 March Clwyd Railway Circle Annual General Meeting followed by “Film Shows - Railways Past and Present”. 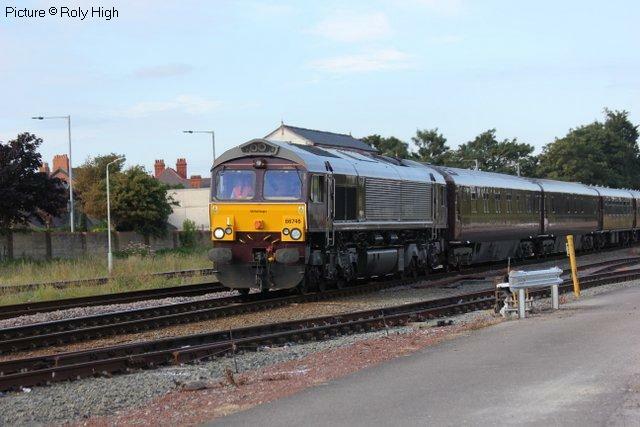 The 09:50 Manchester - Holyhead at Talacre on 6 July, with 67 022 Picture by Tim Rogers. 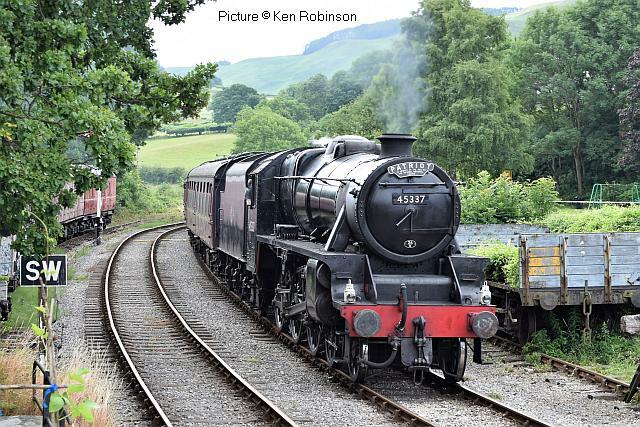 The 'Royal Scotsman' luxury train appeared in North Wales on 9 July on its annual eight-day 'Grand Tour of Britain. 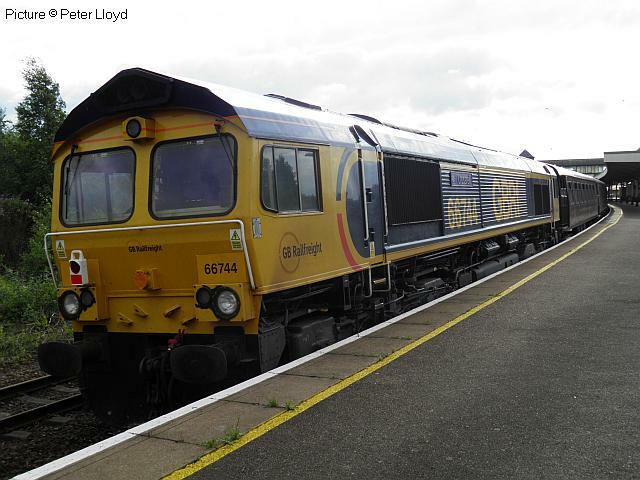 In charge was GBRf 66 746 in its dedicated matching livery, pictured by Roly High passing Rhyl. 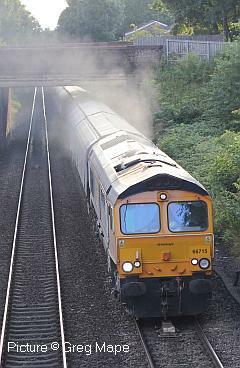 On the rear, 66 744 Crossrail (Roly High). Arriving at Llandudno Junction (Peter Lloyd), where the train reversed to head for North Llanrwst where it would spend the night. The passengers enjoyed a private evening drinks reception at Gwydir Castle, followed the next day by a 'steam-train journey to Snowdonia National Park onboard the Welsh Highland Railway' and a private tour of Plas Cadnant Gardens before proceeding to Bath, Cambridge, York, Alnwick Castle and back to their starting point at Edinburgh. 66 744 (Peter Lloyd).This loco was formally named Crossrail during a ceremony in May 2012, at Northfleet where trainloads of spoil from the new London Crossrail Tunnels are transferred to ships, which was attended by the Thames Gateway Minister and officials from Lafarge, Network Rail, and Crossrail. From Northfleet the spoil is taken by sea to the site of a scheme by the Royal Society for the Protection of Birds (RSPB) to form a new 1,500-acre wetland nature reserve at Wallasea Island in Essex. Crossrail is providing half of the ten million tonnes of material to be used. Our thanks to kentrail.org.uk for this information. Our diagram of the planned future layout at Rhyl (repeated above) caused some discussion. Note that it was only intended to indicate the location of the new crossover relative to the current layout: the signals will, of course, all be replaced. Why put the crossover there, and not at to the west of the station where it would allow westbound trains to call at the main platform 1, perhaps in the evening when the line is quiet, and then continue west? The answer seems to be connected with the fact that 'bidirectional' signalling is to be provided between Flint and Rhyl, and the crossover will allow 'Down' trains which have been running on the 'Up' line ('bang road' in old-time railway slang) to call at the down platform. Although new signals will be installed along the route for this method of working it may take a while before this sytem, which in theory offers additional flexibility, will come into force. This plan seems to have undergone some 'de-scoping' since the North Wales Coast re-signalling, which will eventually all be controlled from Cardiff, was first designed. We have seen a plan which included the re-instatement of an Up Loop between the platforms, which would have allowed a non-stop Chester-bound train to overtake another. 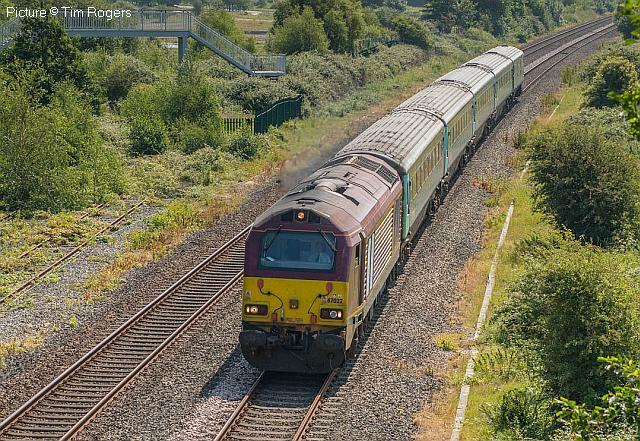 Since Rhyl is a stop for almost all Passenger trains and there be no freights once all the fuel from Wylfa has been removed, perhaps this change of plan is not too surprising. Here's some historic background from Alan Roberts: There have been several plans over the the last 50 years or so to remodel Rhyl, even a proposed plan to build a new 'power box' on the up platform to replace No. 1 & 2 signalboxes. At one point they decided to close No.1 box and control the whole layout from No.2 box. The final decision came in the late 1980s when they decided to control the whole layout from the current signal box (ex-No.1) so in March 1990 No.2 box with its 126-lever frame closed and the layout was rationalised. One of the future proposals they had was to install a trailing crossover somewhere in the vicinity of the 'H' bridge west of the station so that trains could use the Up platform in the Down direction. Of course, nothing came of this. Colas loco 60 026, after visiting the East Lancashire Railway for their diesel event, headed off to Barrow Hill with resident loco 37 418 (seen above at Rawtenstall in 2015) in tow, to be prepared for work on the main line with Colas, for a period unknown to us at the time of writing. 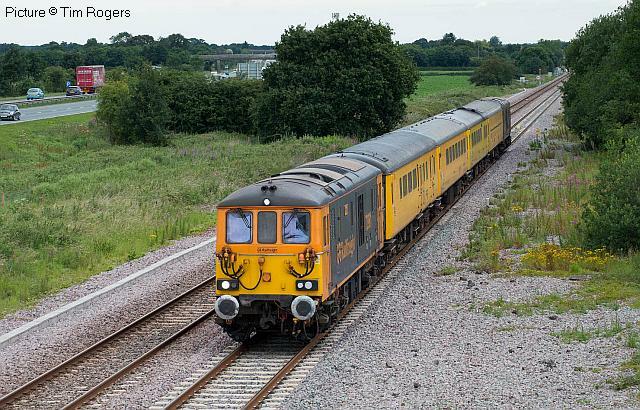 This is not a complete surprise, as Colas have been busy increasing their 37 fleet and have already obtained 37 421 from the Pontypool and Blaenavon line. 418 was repainted in the basis of Large Logo Blue livery some time ago, but there has been no hurry to finish the job by adding the logo and numbers. Presumably it will eventually return to the preservation fold. 37 418, the one-time East Lancashire Railway, later Pectinidae, was part of the North Wales passenger fleet in the 1990s, and was the first 37/4 to receive the maroon and gold EW&S livery based on that of Wisconsin Central, owners of the company after privatisation. 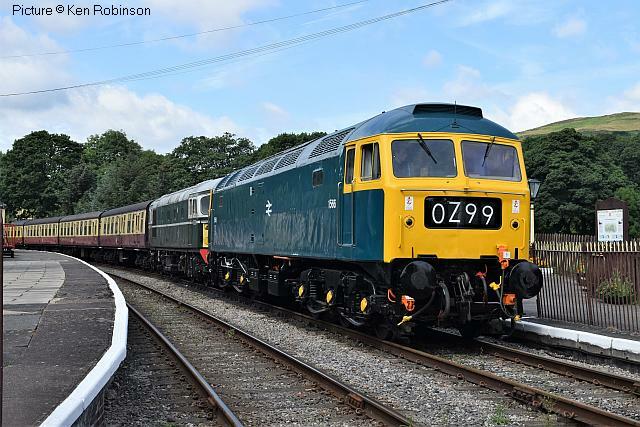 For a while it became possible to re-create in preservation a typical North Wales Coast train, using the Mk2 coaches kept at the East Lancs, but it seems that they have fallen out of favour. A shame. 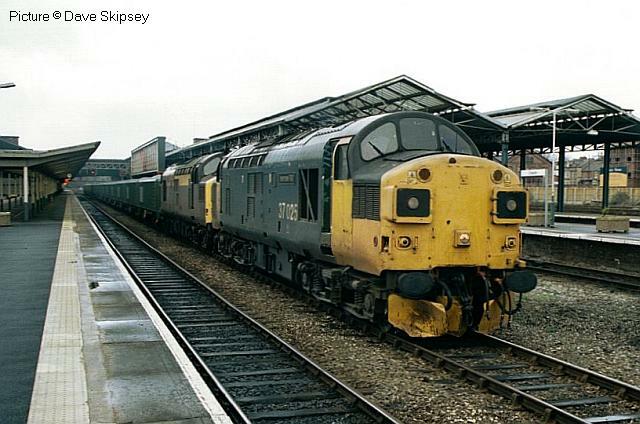 One week later it was allocated for component recovery according to the Class 37 data site. It was rescued by the Scottish Thirty-Seven Group and overhauled at the Bo'ness and Kinneil railway and returned to traffic there in 2007. 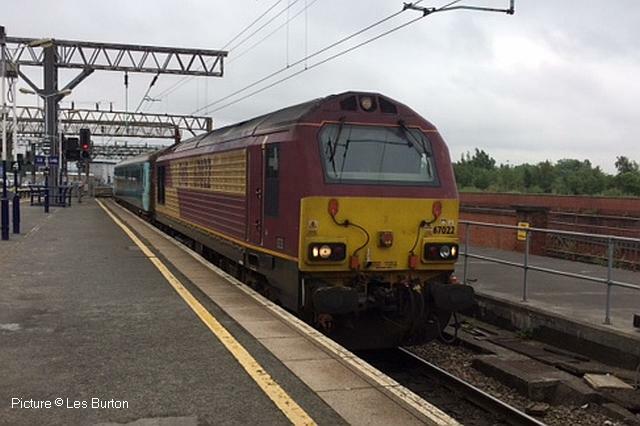 More recently it has been registered for use on the main line, and hired by Colas for their Network Rail trains, although still available for railtours. 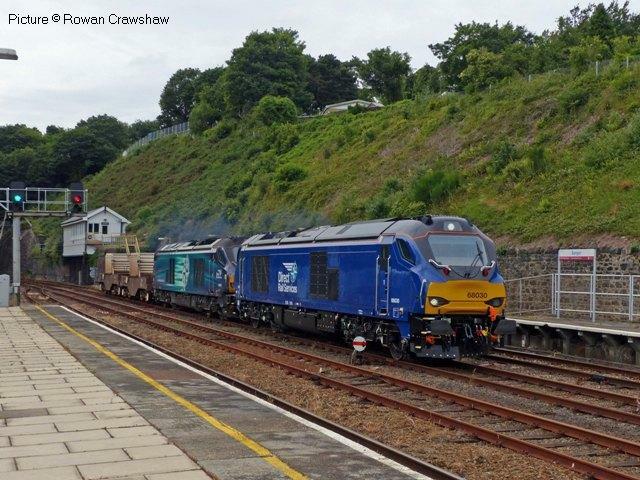 The loco had become something of a celebrity while still working from Inverness depot: it was repainted from 'engineers yellow and grey' back into large logo blue and named in 1994. 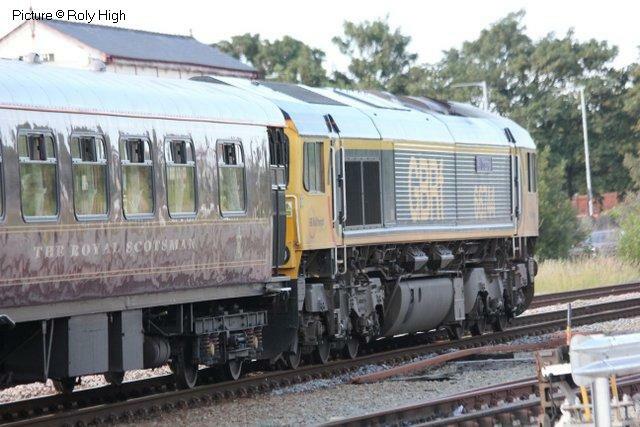 The owners say on their website that it was the first loco to receive that livery. Is they correct? 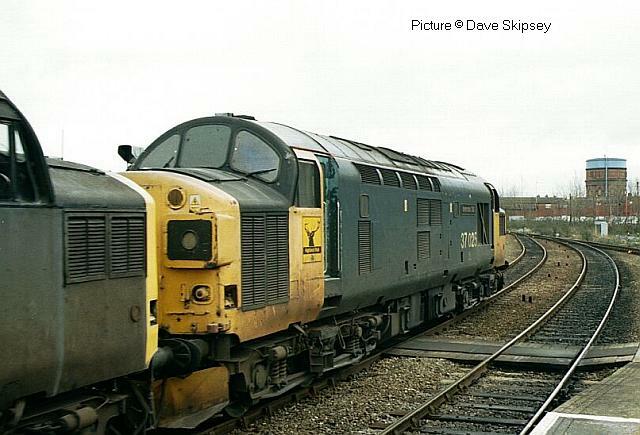 They also say on their website that 'It was withdrawn in 1998 having famously broken down at Stockport.' Other sources, however, date that event to February 1999, when the loco failed while working a Virgin train for some reason: the 'famous' tag arose because the driver asked the guard to ask the passengers over the PA if anyone had an adjustable spanner. 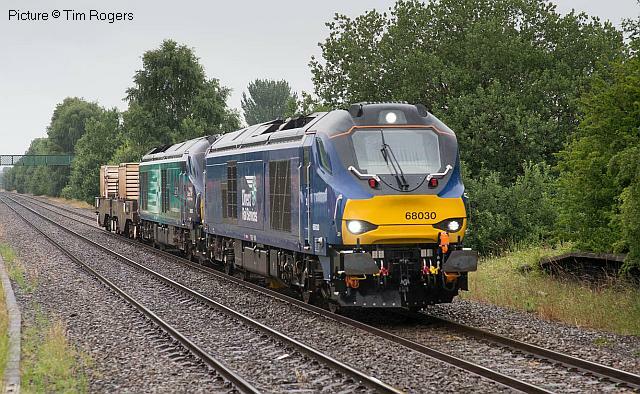 It seems that SRA are using the Valley flask train as a way to test/keep busy the Class 68s destined for TransPennine passenger services. Here's a selection of pictures received. 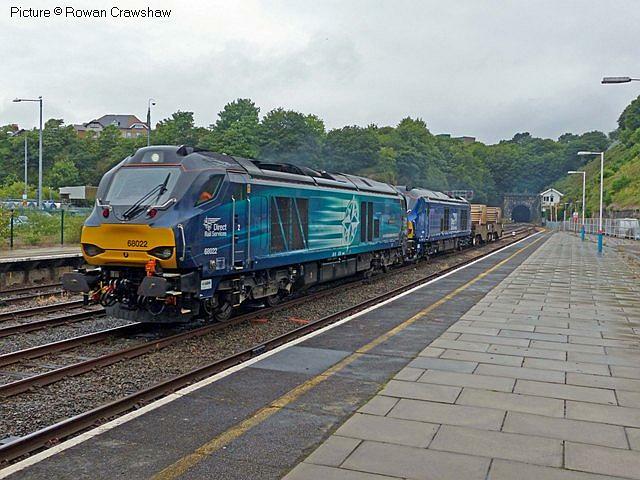 68 030 and 68 001 Evolution pass Bangor with the 6K41 Valley to Crewe flasks on 26 June (Rowan Crawshaw). 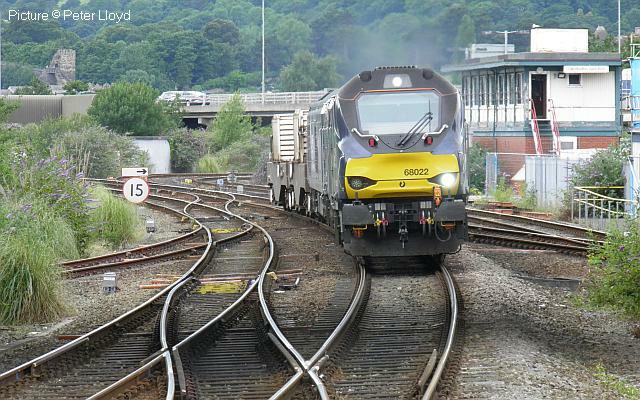 68 022 Resolution and 68 029 pass Bangor with the 6K41 Valley to Crewe flasks on 28 June (Rowan Crawshaw). Flint (Tim Rogers). 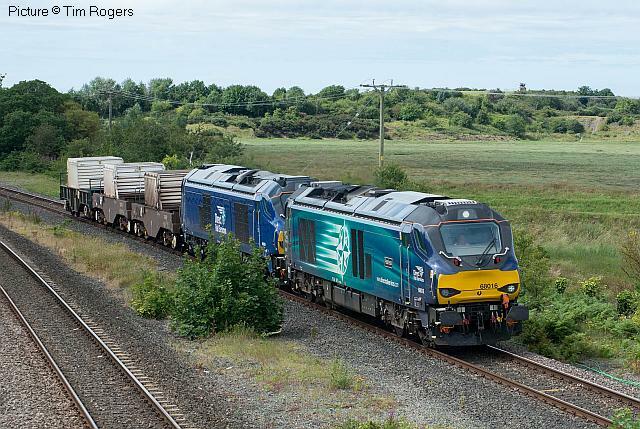 The wagons are FNA 550030 and 550046. 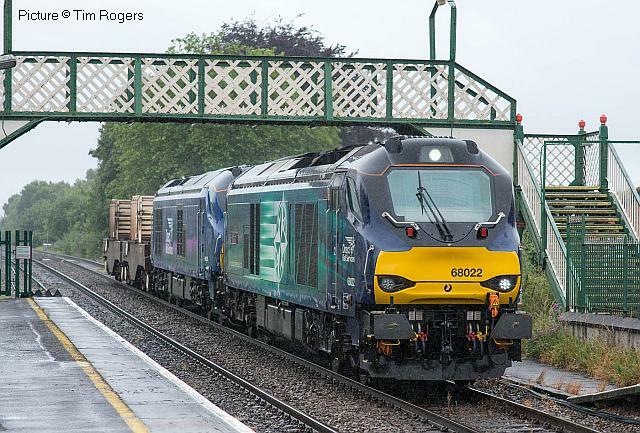 30 June at Shotton (still raining) with 68 030 and 68 003 Astute (Tim Rogers). What's happened to the DRS Class 37s then? 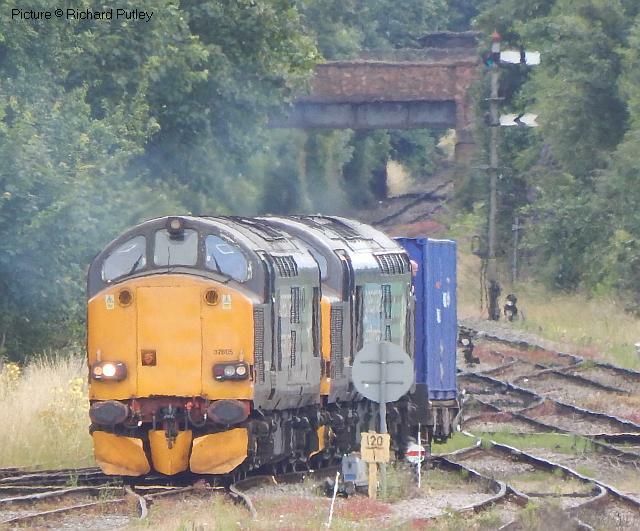 Well, here are 37 605 and 37 602 at Worcester Shrub Hill on 4 July working a train of what appears to be low-level nuclear waste from the closed Berkeley power station to Sellafield. On 7 July, 68 022 and 68 029 appeared, their numbers coincidentally matching the two locos on Coast passenger duty that week, 67 022 and 67 029. 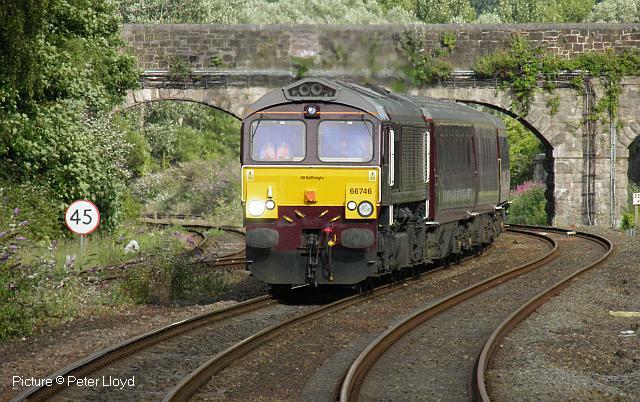 Picture at Llandudno Junction by Peter Lloyd. 8 July on the Llangollen Railway was almost like a gala with two diesels and two steam engines in action. Above: 1566 at Glyndyfrdwy looking very smart after its overhaul and paint job. 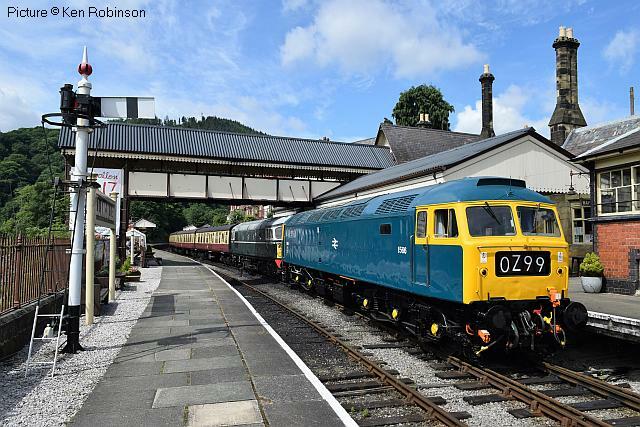 It was given a loaded test run yesterday, working with D5310 on the first round trip only (the10:00 from Llangollen). 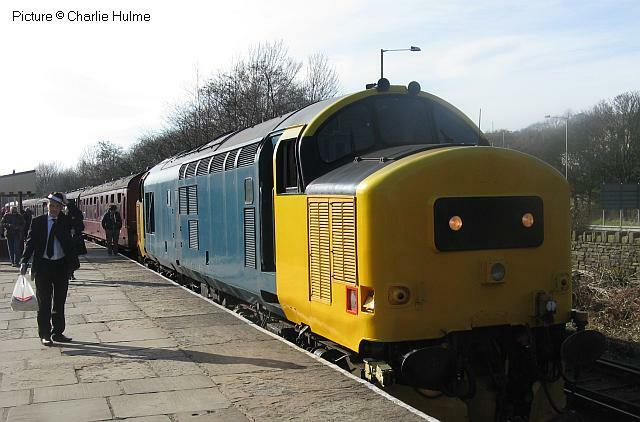 45337 was also in action on a charter to raise money for the Patriot new build. It is seen here approaching Glyndyfrdwy, taken from the signal box, with permission. Thankfully the train was full. The Gobowen Area Improvement Group (GAIP) have announced they had completed the purchase of the buildings on both the up and down platforms at Gobowen Station. 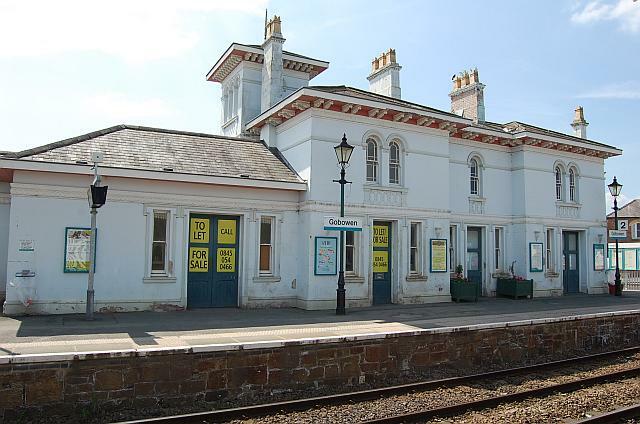 The station buildings had been in private ownership for many years and were destined to be sold at auction, however intervention by Selattyn and Gobowen Parish Council with a Community Right to Bid application opened a path for the buildings to be secured for the community. 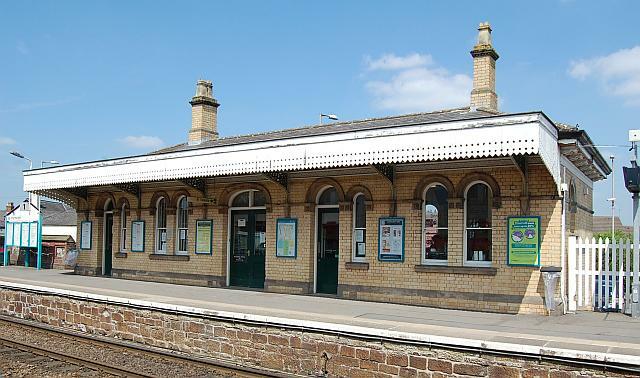 This acquisition provides the foundation for an ambitious project to see the historic station returned to a former glory whilst also providing a connecting rail service to Oswestry with intermediate stations at the Orthopaedic Hospital and tourism venues along the route. The development will also considerably enhance the employment opportunities within the local area, particularly in tourism and engineering within the railway spectrum of the project. Through the Community Right to Bid process the group had to raise the necessary funding for the purchase and sought assistance from Three Parishes Big Local, the Big Lottery funded programme led by local residents that is investing in Gobowen, St Martins and Weston Rhyn. 67 022 brings the stock for the 09:50 Manchester - Holyhead into Manchester Piccadilly, 4 July (Les Burton). 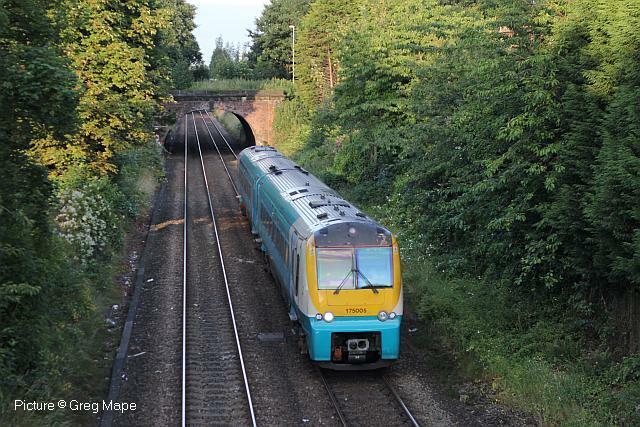 Diverted due to Sunday engineering work, 175 005 passes the site of the former Baguley station with a Manchester - Chester service on 9 July (Greg Mape). Rossett on 3 July (Tim Rogers). 73 961 Alison leading Network Rail Support coach Mk2d, BSO 9481, Plain Line Pattern Recognition vehicle 'PLPR4' Mk2f 72639 Ex Gatwick Express, Network Rail Track Inspection Coach 2 "TIC2" Mk2e 977974, Network Rail Brake Force Runner 96609 and 73 964 Jeanette at the other end. The working was 1Q41 13:13 Derby R.T.C. (Network Rail) to Crewe C.S. (L&NWR Site) via Peak Forest , Cheshire Lines, Bidston, Warrington, Hooton & Chester, Liverpool & Chester. 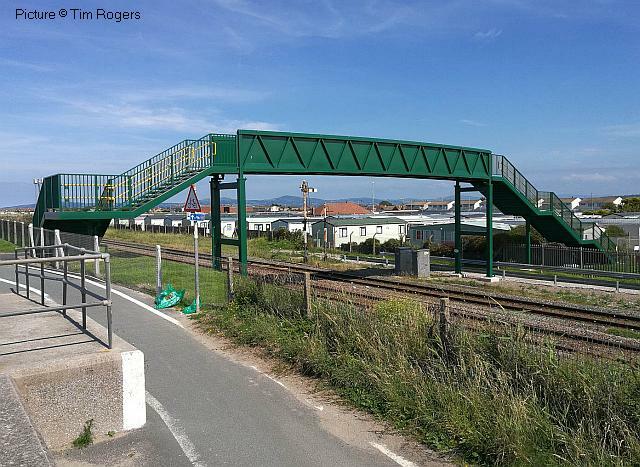 Smart footbridge recently erected at Abergele (Tim Rogers). 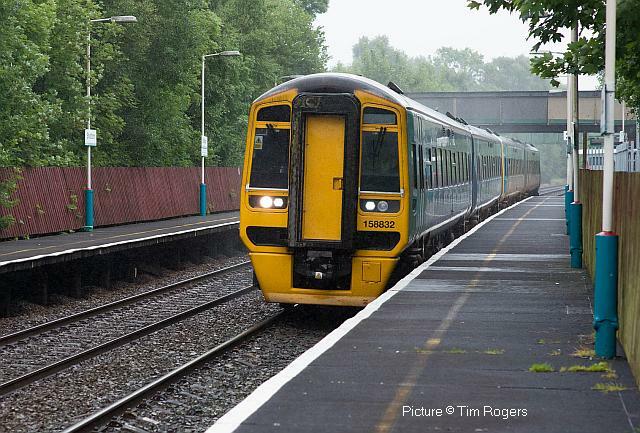 158 832 and 158 827 working 1D14 13:08 Birmingham International to Holyhead at Shotton, 30 June (Tim Rogers). ... but in the 1950s, several members of the class were allocated to Rhyl motive power depot for working local freights. This picture taken there by Harold Bowtell on 13 May 1950 (Manchester Locomotive Society Collection) shows 52167 in the foreground, with 52172 behind. Beyond are ex-LNWR 'coal tank' 58889 and an LNWR 'Cauliflower' 0-6-0 still carrying its LMS number 28585. Rhyl station can be glimpsed in the distance. 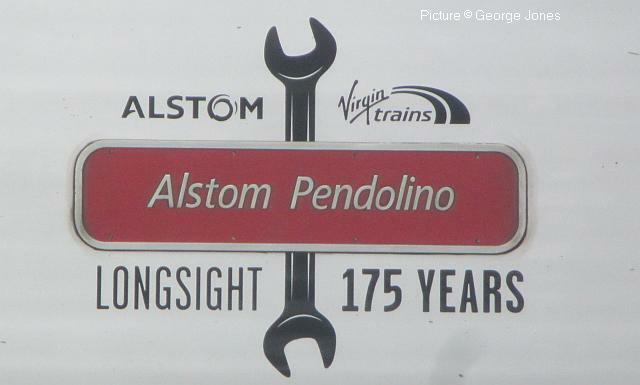 Virgin Pendolino unit 390 104 Alstom Pendolino has received added decoration to mark the 175th anniversary of Longsight (Manchester) depot. An open-day event had been planned to celebrate this, but unfortunately it will not be taking place. Alstom say that there is development in the depot this summer, so a depot open day is not possible due to health and safety regulations. In other naming news, a 'think of a name' competition to celebrate Virgin Trains' 20th anniversary was won by Michael Dally of Runcorn who suggested 'Flying Scouseman' which has been bestowed upon 390 148, ex-Virgin Harrier. Progress at the Llangollen Railway's Corwen Central site continues apace. 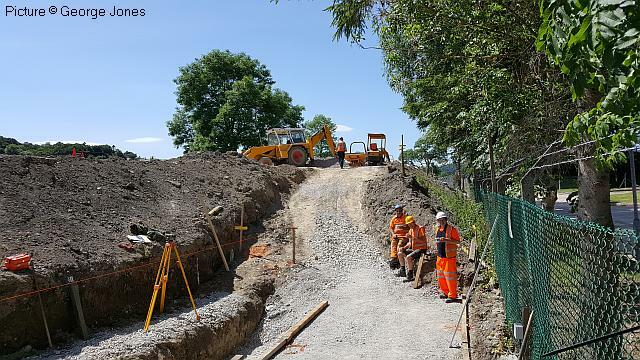 The excavation of the embankment on the northern side of the site has provided the space for the installation of the foundations and retaining walls for the signalbox. This is a key element to the preparation of the adjacent area which will see the eventual location of the points for the station loop. 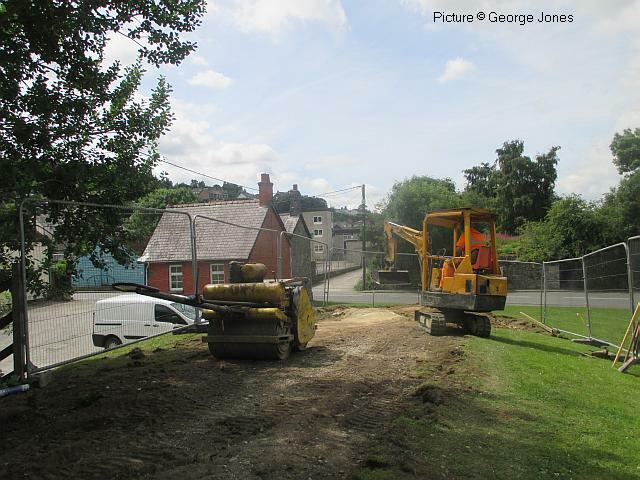 Over the past five weeks the site opposite the Corwen sewage works has been surveyed and dug out to a depth of 10 ft. The foundations were built up to a modern standard of porous membrane, geo-grid plastic mat and crushed stone topped up with a coat of ready mix, all done by the volunteer labour. This allowed contractors to move in and install the reinforcing rods and bars with shuttering to form the base of the box structure. The pouring of concrete followed on Saturday 8 July. 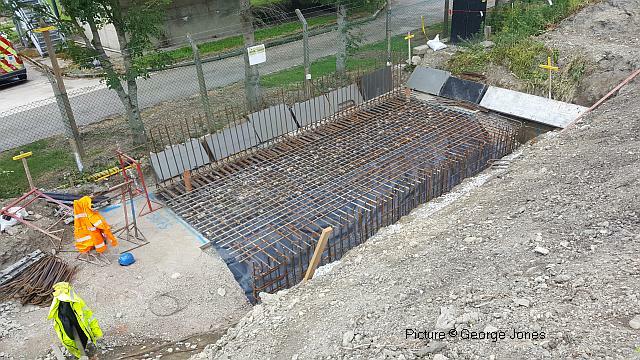 When set the contractors will be back to prepare the reinforced retaining walls which will form the box as the base up the embankment ground level for the restored former Weston Rhyn signalbox - which still sits at Carrog. Meanwhile the block work to build up platform 2 has been completed and a start has been made on the extension of the western end head shunt. This has required dismantling of the stop block and surveying of the ground onto the grassy knoll which forms the remains of the original embankment out onto Green Lane and marks the end of the 2010 Transport & Works Order. The picture shows the initial levelling of the intended track bed. To bring equipment to the site a temporary road has been built up the side of the embankment from the Welsh Water Road entrance. The ground level requires building up by 2 or 3 ft and ballasting is expected soon. One and a half panels of track will then be laid and the stop block reinstated with fencing to follow. The challenge of building platform 1 remains to be started once this current work is out of the way.